Suzona Pitkin takes some time to get some thrift shopping in at the new Pets In Need Thrift Store on Colfax Avenue. “When we started this in 2014, we were handing out pet food from the back of a truck,” said a beaming Patti Galle. Galle’s nonprofit, originally called Nevada County Pets of the Homeless, also provides veterinary care, licensing and rabies vaccinations to pet owners who can’t swing those costs. 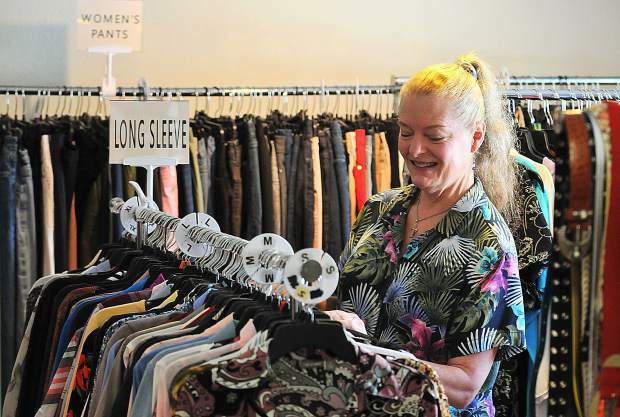 And now — in order to fund the growing demand — Pets in Need has opened up a “boutique” thrift store in back of their space on Colfax Avenue in Grass Valley. The thrift store is openly open three days a week — Thursday-Saturday — and has a unique twist: everything is on sale for a dollar. “Actually, because we have so many women’s pants, they are two for $1,” Galle said. Galle said the decision to start a thrift store was fueled by the need for a steady income to fund services. Most of the dry food comes from the Reno SPCA, but the wet food and vet care are funded by cash donations, Galle said. All of the staff is volunteer, and every penny goes back into the nonprofit. A volunteer does cull the more valuable items and Pets In Need sells them online, Galle said. Pets in Need is always open to donations of gently used clothing and small items — they just don’t have the room for anything else, she said.